Slash soloing atop Axl Rose's piano in video of "November Rain"
Axl Rose, Slash, and company paint a bleak new world on edge where almost nothing seems certain. Lyrics, hot-air-balloon-big orchestral backing and devastatingly strong lead guitar breaks teetering on the edge of coherence make for the classic power ballad of the early-'90s. If you're keeping track of singles from the period, "November Rain" is the B side of the highly entertaining "Sweet Child O' Mine," both tracks leaping off album Use Your Illusion I, an 8x platinum-seller that also features "Coma," "Dead Horse" and a cover of Paul McCartney & Wings' "Live And Let Die." Amidst the sound effects of wind and a symphony orchestra, Axl Rose kicks the song off with a moody, ever-so-vaguely-closing-movie-credits piano solo that is then joined by the BIG drums of Matt Sorum. Big big drums. A flute line wends its way in and around the cozy, familiar piano. Two people making vows, but both knowing something is being held back. While we know that Axl's real life relationship that "November Rain" is based upon did not work out (with model/actress Stephanie Seymour) it immediately rises above the particular and flies into the universal. Sages from every time have asked "What is the meaning of life?" The role of great Rock music has been to ask "What is the meaning of love?" Guns N' Roses gives listeners a thorough but – as is necessary and expected – incomplete answer. Meanwhile, the music rises (though weighted down by sentiment) along with the lyrical outlook. If it is feasible in the first place, "November Rain" blends Anthem Rock with Symphonic Rock and... of all things, the Blues. The singer, the bearer of a strange petition, is racked by the past and knows that his counterpart with whom he is falling in love, is likewise agonized by her own issues. Through this first movement, Slash (below) lurks, sounding as if he is warming up for his first solo. Once on center stage, from the first few notes, he delivers the kind of work that ranks him in the hallowed halls of definitively phenomenal guitarists. You easily might think that the usual guitar strings – E-A-D-G-B-E – had been replaced by M-Y-P-A-I-N. It is terse, evocative of what lies beneath words. Slash's work is all the more interesting because he had resisted Rose's push into more mature Rock – specifically ballads – but, clearly, since the band had been playing some form of "November Rain" for six years, the grand guitarist's mind had long been at work. The singer can't make a stand on his mountain of love, and by way of not being able to address his own reluctance squarely, he hands the hot potato back to his lover, hoping she will head for the exit. This is the kind of music that incites people to light their lighters and sway back and forth as one. After the second Slash solo, the song puffs up its chest and becomes the giant it had been hoping to be in the long, mind-searching lead up. At this point, the music continues to soar as the lyrics seem to be coming to a resolution. But there is something terribly wrong. The song moves into a coda, a little jazzy piano bit laid down by Rose, changing the tempo to a pace more in keeping with past Guns N' Roses grooves. The band was in the midst of dissolution and it seemed – unconsciously perhaps – the right time for them to pay homage to the greats who had paved the way for their achievements. 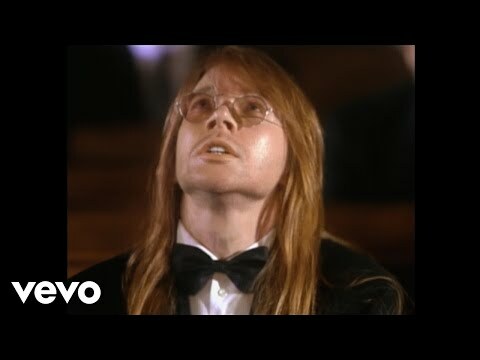 We can only speculate, but it may be that the powerful undercurrents running through "November Rain" are not just about the difficulties of couples' love, but more about a farewell to one of the greatest Rock bands of any era, and one that certainly boiled down and epitomized the mid-1980s to early-'90s. It is draining. It is satisfying to realize one more time that the music can rise to such dizzying altitudes. Check out our selection of GN'R merch here. “November Rain” was GnR’s last Top Ten hit. Blended into a sharp-tasting draft of Rock that's been fermented into a tasty, spacey brew with a big foamy head.